With the stadium lights flooding Fisher Field, students run, flick, and cheer. Ultimate Frisbee, a club team at Lafayette, is in full practice mode. Backhands wiz around as players advance downfield. 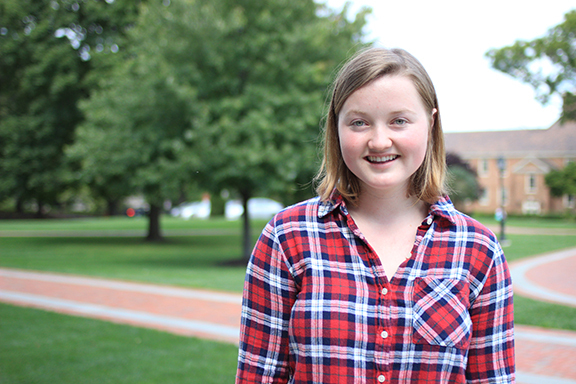 Alexandra Scholefield ’21 is one of those players. She may not be the most competitive nor the most accurate passer, but she is beaming with joy. The deep happiness she feels is one that originated on a shipping dock in an African port. Picture an eight-story ship, a city on water, that holds 450 people. It’s Friday night, and 50 people step off the ship to pick up a flying disc. Age, rank, and tenure all disappear as students, officers, and doctors start playing Ultimate. The strenuous week she was escaping came from the crew performing hundreds of surgeries: benign tumors, cleft palates, cataracts, and fractures. Each day the blind would soon see. People ostracized by disfigurement would be welcome home. Scholefield was on Africa Mercy, a floating hospital that docks for months in ports along the arc of Western Africa. For six months she served on the ship in the city of Cotonou, Benin, a country between Ghana and Nigeria. How did this young woman from Southern California climb aboard this medical ship? She paid to be there. Scholefield knew she needed a gap year after high school. She was burned out. She also was caught in a rigid sense of self-identity. As captain of her swim team, she lived in the water with year-round practices two times a day. That’s until she needed knee surgery—three of them. Without swimming, her foundation was shaken to the point of crumbling. Slowly she began to find new ways to define herself. As she discussed a gap year with her parents, both supported the idea. As an athletic psychologist, her mother recognized her daughter’s burnout and understood its potential side effects. Scholefield sought a long-term service trip abroad and found Mercy Ships. The Texas-based nonprofit has ships all over the world that provide free medical care to those in need. Each year a ship pulls into another port, assesses the country’s needs, and then finds doctors, nurses, and staff willing to pay for the opportunity to serve. There can be high turnover as surgeons and medical staff fly in for a “vacation.” The surgical team is supported by over 200 locals who serve as the day crew. All live on board and share in caring for patients. And the jobs on the ship range, like any hospital would, from medical to dietary, from housekeeping to maintenance, from classroom teaching to gift shop management. Scholefield started in the kitchen, leading the cold side—chopping vegetables and preparing salads. After a month she transferred to reception, welcoming new crews, patients, and administrators. She rotated across three shifts since care is a 24-hour business. That’s why Ultimate Frisbee became such a release. She had others as well. Developing friendships with other young adults on the ship was easy. Losing them was harder. People whom she might not have noticed in her former life became dear friends. Value now comes from navigating a new ship on College Hill. Scholefield is excited to be here and sees the gift that education is and the benefits it brings. She is finding the clubs and programs that match with her worldview and life goals. As a chemical engineering major, she is prepared to do what she learned on the ship: dive into her work, form lasting friendships, and discover new ways to perceive the world. And, of course, work on her backhand while having fun tossing around that Frisbee.